serena the magnolia's lover: MAGNOLIA ADVENT CALENDAR BLOG HOP! Oggi è il mio turno ;o) Sono contenta di mostrarvi un progettino veloce se avete bisogno di creare qualcosa di "vischioso" o se avete bisogno di una scusa per un bacio ;o))) Ho fatto questa semplicissima borsa porta-vischio usando Tilda under Mistletoe Penso che sia dolcissima! Mi raccomando non dimenticate di lasciare un commento per questo blog hop! Avete la possibilità di vincere un premio speciale direttamente dalla Magnolia!!!!! I made this simple mistletoe bag using Tilda under Mistletoe I think she's soooo sweet! Please don't forget to leave a comment for this blog hop! 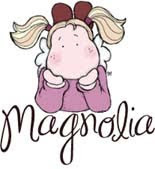 You have a chance to win a special gift from Magnolia!!!!! Materiali/Materials: Carte/Papers: Bazzill, My Mind's eye. Fiori/Flowers: Wild Orchid Crafts. Perle/Pearls: Kaiser. Alfabeto/Alphabet: American Crafts. Nestabilities (label 14), Magnolia Doohickeys Tilda Lace and SU! (foglie/leaves). Copics. P.S. A proposito dell'ultimo giorno dell'anno....alcune tradizioni Italiane che portano fortuna: indossare biancheria intima rossa, mangiare 3 chicchi d'uva, e naturalmente le lenticchie!!! E ricordate che quello che si fa a Capodanno si fa tutto l'anno (o almeno si spera!) BUON ANNO A TUTTI!!!!! una bella idea da fare feloce. Qualche volte ci servono delle piccole idee. What a lovely idea! Beautiful and fun! gorgeous creatioN! love the mistletoe! chi scrappa l'ultimo dell'anno scrappa tutto l'anno!!! What a nice idea! This Tilda is so cute! Its beautiful and what a lovely idea, the image was just made for your packaging. Oh, what a great idea! It's so lovely, this Tilda and the mistletoe! This is just adorable! So cute!! Veramente carina questa idea per il vischio! E questo timbro Magnolia è davvero dolcissimo!!! Awe.... Love your little Magnolia TOPPER for your bag of mistletoe! How adorable. Your coloring is super! Hai Serena, what a cute bag, love it. Good idea for a gift to my single daughter! I enjoyd looking around on your blog, thanks for sharing this al to us. Felice e creativo di Capodanno! Beautiful creation. Love your colouring of Tilda. It's a great image of Tilda. She is so cute and really nice coloring. What a brilliant idea, I love it. Very effective and an excellent gift idea. Beautiful choice of papers and colours too. Tes mignon petit ensemble pour la nouvelle année, on s'y croirait déjà!!!! I love it!!! I love this brilliant gift idea, the papers and colours are gorgeous. Happy New Year. What a lovley Magnolia gift bag you have made. Thank you for the tips on the last day of the year. That is lovely! What a cute idea. Darling Serena~~love the pearl accents around the sweet image!! Happy new year to you to, and a lot of luck in 2011 .. Thank you for the change to win ..
What a lovely idea, one to remember for next year. Your colouring is beatiful, wishing you a Happy new Year. Fantastic idea with the misteltoe. Goog colouring. Happy Newyear to you from Denmark. À great idea. I'm going to do one myself. what a cut stamp, and i love the idea! This is so sweet!!! What a fabulous idea and I love this Tilda too! Wishing you a Happy New Year and thanks for the chance to win! Bravo for the fun idea! Love the dps and the lovely embellies!! ..what a wonderful idea - really beautiful bag topper..
Beautiful tag , lovely coloring !! day you have good luck for the new year. Very cute! A simple, but really beautiful project. I love the paper you have chosen and the coloring is gorgeous. Hope you have a happy new year and wish you a creative 2011! Wow, this idea is so great! If I would have seen this in a shop I would have bought the mistletoe package right away! 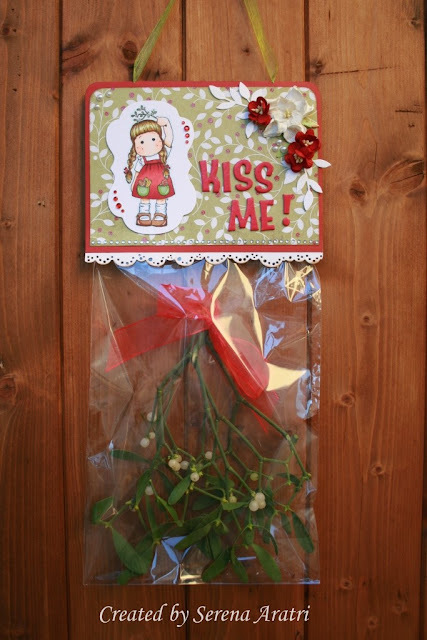 a great idea for a give away pack... a mistletoe, so pretty. I´ve never seen like this. Great idéa!! It looks great! Gorgeous Serena and such a clever idea. This is a very nice topper. Very clever idea. What a great idee you had making this bag. Very clever idea. Great colors. This is so sweet. Lovely clever idea. Enjoyed the telling of your tradition. Just love this little Magnolia. awwwwwwwwwww this is so romantic. What a sweet idea - the mistletoe-kiss me tilda-bag - I really like it ! And I love the way you colored Tilda. And what I also really like is your sharing of what you do on New Years Eve - it's so nice to hear about different customs in different countries ! Gorgeous and lovely bag for mistletoe!! Great idea. Ahoj, velice krásný projekt, přeji hodně štěstí všem. Lovely work! My compliments. I too like to work with the Magnolia stamps. Am a beginner but every free moment I am stamping! Serena, fabulous project. Adorable Tilda--so wonderfully coloured. Lovely paper and gorgeous flowers. Beautifully put together--love it. Great Creation!!! Lovely Gift Wrapping! Great Colours and Colouring! I love the idea!! Adoro le cose che fai!!! Fantastica la borsa porta-vischio!!! A beautiful topper Serena. Mistletoe to go! I will be trying out that Italian traditions for a lucky New Year. I hope yours is great! What a wonderful gift! Really gorgeous! Great idea, love the colors. Thanks for sharing. What a fun little gift! Tilda is so sweet in this image. I love green & Red! Wow, that looks super. Verry nice bag and i so love Tilda. Thanks so much for taking the time to share your wonderful talent with us!!! Wonderful. I love this Tilda. Beautiful creation, love the colours. Thanks for the last day tips!!! Have a Crafty New Year!!! molto bella la tua idea del "portavischio". Questo timbro e veramente carino! Ti auguro un buon 1011 ricco di nuove idee!! Una busta portavischio veramente favolosa! Poi i timbri Magnolia sono tutti veramente bellissimi. Ti auguro un 2011 pieno di nuove idee! So cool thing to do. Love it. Una busta portavischio veramente fantastica!!! Poi il timbro che hai usato e fantastico, tra i miei preferiti. Ti auguro un buon 2011 con tante idee creative! What an awesome creation, just love it !!! What a cute bag and fun idea! Lovely. Hi, this is a lovely idea! I should have seen ir earlyer, I bought a hole bunch of mistletoe! Thank you so much and all the best for 2011! What a great idea, really fun and absolutely gorgeous!! una busta favolosa!! Molot bella!! grazie per la possibilità di vincere. Ti auguro un buon 2011. This is such a sweet idea!!! thank you for this inspirastion!!! Cool idea we all need kisses lol Artwork is super too. I love theidea of the Italian tradion for the last day of the year I must tell my friends too. All the best for the New Year and thankyou for the chance to win Magnolia goodies. So cute and lovely idea. Happy New Year. Lovely "mistletoe-wrapping", very nice indeed!! What a marvelous Idea....Just Stunning. She is sooooo cute...we should be kissing every day. Give a kiss for Freedom!!! I wish you a very happy and creative New Year. Oh this is just beautiful! What a lovely idea for the mistletoe! such a great idea !!! Oh this is so cute Serena!!! Very very cute! It is a really neat idea too. Ohhhh c est tellement mimi ! Oh wow what a gorgeous bag you have created for the mistletoe. I adore the beautifully coloured image and the dp is really nice too. 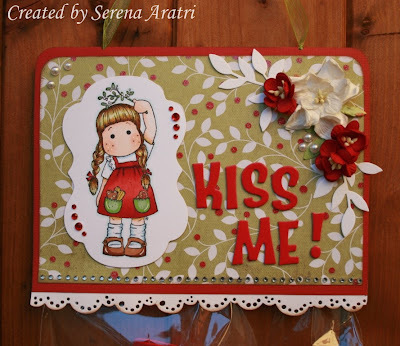 Fabulous project Serena,i love the cute tilda.Thanx for sharing it with us. What a lovely creation and what a great idea. I love it!! e non mi hai delusa...un'idea veramente bella ed originale..
Con tutto il mio cuore!!! I hope you have a healthy and nice 2011. This little bag for the mistletoe is very,very charming!I love it!Bravo,bravissimo,Serena! What a cute project. I love that Tilda!!! Thank you so much for sharing with us. Ohh how cute!! I love this color combination :) beautiful project. What an adorable card and wonderful use of this image. This could be used for Valentines too, I suppose. Love the Italian tradition you posted too - hmm, will have to think about what I am going to do on the last day of the year. Aww this is so sweet and gorgeous. What a sweet creation! Your colouring is gorgeous! Wow this looks very pretty. Love the colours. A great idea --- A mistletoe bag!!! The top card is very cute & fitting for the gift - the colours are perfect! I think this would be a great hostess gift to take with you --- unique!!! That is so sweet! Its one of my favoutite Magnolias. I love this Tilda and especially love how you have coloured her - what a fab bag!! Great idea, this Magnolia fits with this perfect. Great coloring. Thanks for sharing. Oooh this is such a great idea, it can easily be adapted to the occasion. I'll keep that in mind. Great idea and soooo very sweet! Your image is adorable and your coloring is beautiful! Happy New Year! This is such a beautiful mistletoe hanger. I am sure anyone who sees this hanging in your house will surely fall in love with it! And Yes a Kiss beneath is would be necessary. What a wonderful idea, and special project! I love it, this is so cute! I also love your colouring it is awesome! Wouaw vraiment de toute beauté vos créations félicitation !!!! Serena that is so cute - I don't think I have actually seen real mistletoe - we don't have it in Australia. Hope you have a lovely NYE. Oh that really clever Serena and so sweet! What a lovely idea! I really like it. I love your little Tilda and with the Misteltoe, so cute! I am loving all this Magnolia Inspiration, plus a chance to win all bundled together! Mmmmwwwwwwwwwwaaaaaahhhhhhhhhhhh, LOL!!!! It is such a sweet gift! I love the topper and your Tilda is adorable. I think it is such a clever idea! Thank you for sharing! un risultato che bello! una magnolia bella, e un bellissimo fregio! What a great idea. I love this Tilda too... Thanks for sharing. Very sweet! Great idea too! What a sweet idea and it's the perfect little Maggie for your bag of mistletoe. Stunning!!! What a lovely idea and your Magnolia is colored so wonderfully . I love the mistletoe package - what a brilliant idea! WoW, this is so beautiful!! Love youre colouring! Absolutely adorable. What a great idea and what a wonderful gift this would make. How clever you are. This is gorgeous! So adorable and cheeky with the mistletoe! Tilda and mistletoe...what a natural! I love it. fabulous idea and I love!!! !thanks for the chance to win! What a great idea...I "colored" a mistletoe, cute but not the same as having the real thing. I will save this idea for next year...Thanks a bunch! Oh, Serena, that is the cutest idea! I just love it. Tilda is perfect for the packaging and wonderfully colored too. hope I'm not too late!! you've only just arrived - but Tlda's always welcome. So very sweet!!!!! Love this Tilda! now that is a very cool idea ! genuis ! i love it ! How cute this project is and I love Tilda w/mistletoe! e ti auguro un buon anno nuovo.. Very sweet! What a cute idea. Serena, Thank you for sharing this wonderful idea with us!! And, also some of your new year's traditions!! I hope you have a wonderful New Year! !